Not so long ago, I told the tale of Jeanne Garnerin, the first woman to make a parachute descent. Her story certainly captured the imagination of salon guests and quite a few got in touch to ask about the first ever descent, which was made by her husband, André-Jacques Garnerin. Since today is the anniversary of that exciting event, it seemed like an excellent time to revisit the moment! Garnerin initially developed an interest in using balloons for military purposes during his time in the army and, following two years as a prisoner of the English, he returned to France with dreams of flight. 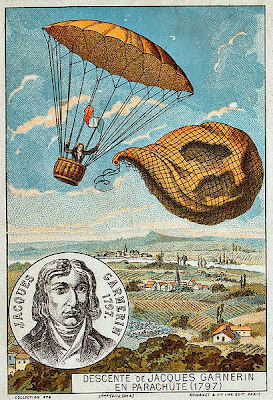 Garnerin devoted his time to pursuing his passion for ballooning and caused a scandal when he appeared before Paris officials to make a case for taking a young woman up for a flight, an utterly unthinkable idea. His wish was eventually granted and Garnerin was propelled into the celebrity sphere, his press not all harmed by the fact that the woman in question, Citoyenne Henri, was young and beautiful. The flight was a success and Garnerin turned his mind to the next escapade, reasoning that he had made a dramatic ascent, so perhaps it was time for an equally dramatic descent! The balloonist absorbed himself in experiments involving parachutes, eventually ready to make his first public descent. 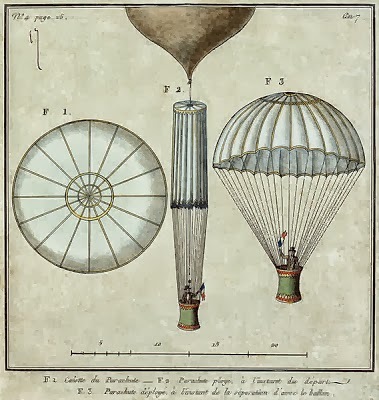 On 22nd October 1797 a crowd gathered at Parc Monceau in Paris to watch the daring feat of aeronautics as Garnerin ascended to a height of more than 3000 feet. Far above the park he cut the ropes that attached balloon to basket and began his descent with the help of a white parachute, 23 feet across and in the shape of an umbrella. As the basket buffeted and swung the crowd must have wondered if Garnerin would make it safely back to earth but happily, he did just that. Garnerin's reputation and career were set from that moment on and with his wife, Jeanne, he became renowned throughout Europe. Many more parachutists would follow from ever more dizzying heights but for all of that, it was Garnerin who landed first! He took *many* young ladies up on flights.. it's how he met his wife, the cheeky tyke!